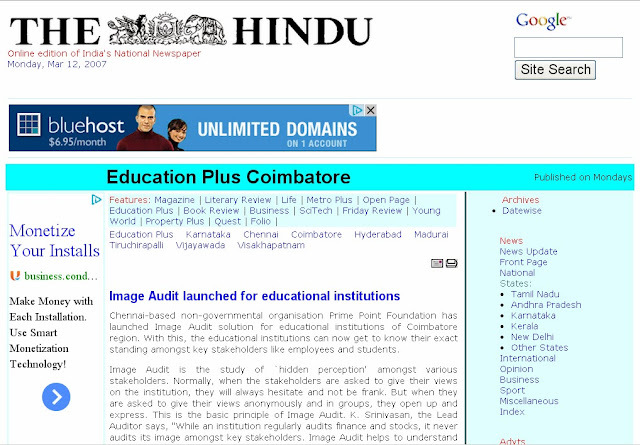 Chennai-based non-governmental organisation Prime Point Foundation has launched Image Audit solution for educational institutions of Coimbatore region. With this, the educational institutions can now get to know their exact standing amongst key stakeholders like employees and students. Image Audit is the study of `hidden perception' amongst various stakeholders. Normally, when the stakeholders are asked to give their views on the institution, they will always hesitate and not be frank. But when they are asked to give their views anonymously and in groups, they open up and express. This is the basic principle of Image Audit. K. Srinivasan, the Lead Auditor says, "While an institution regularly audits finance and stocks, it never audits its image amongst key stakeholders. Image Audit helps to understand the perception. It is a like a `Master health check-up' for a human being. In other words, it is a "Master perception check-up. "He further says, "Normally, in every educational institution, the important stakeholders, including employees and students will have their perception on the management. The `hidden perceptions' of the employees will help the managements to plan their strategies suitably, if found out. Image Audit provides the `perception study'. It is the only tool that can help the management to understand the `hidden perception' and deficiencies in the system in time and prevent any possible crisis. Image Audit also helps the management to build its brand amongst its stakeholders, by understanding the real needs." Image Audit is becoming increasingly popular the world over. Because of the importance of `perception study', some of the leading Global Research Organisations have started undertaking this. Understanding the growing importance of Image Audit, Anna University, Chennai has included it as a paper for PhD students in Communication studies. Mr. Srinivasan explains the various stages of Image Audit like discussion with the management to understand the issues and preparation of questionnaire to suit the different stakeholders, test auditing the questionnaire and finalising the questionnaire and administering the questionnaire to the stakeholders. Grouping the target audience and asking them to respond with an assurance of anonymity is also part of the procedure. Coding and data entry, analysis of collected data, preparation of draft report, discussion with the management and presentation of the draft report is carried out before submitting the final report to the management.